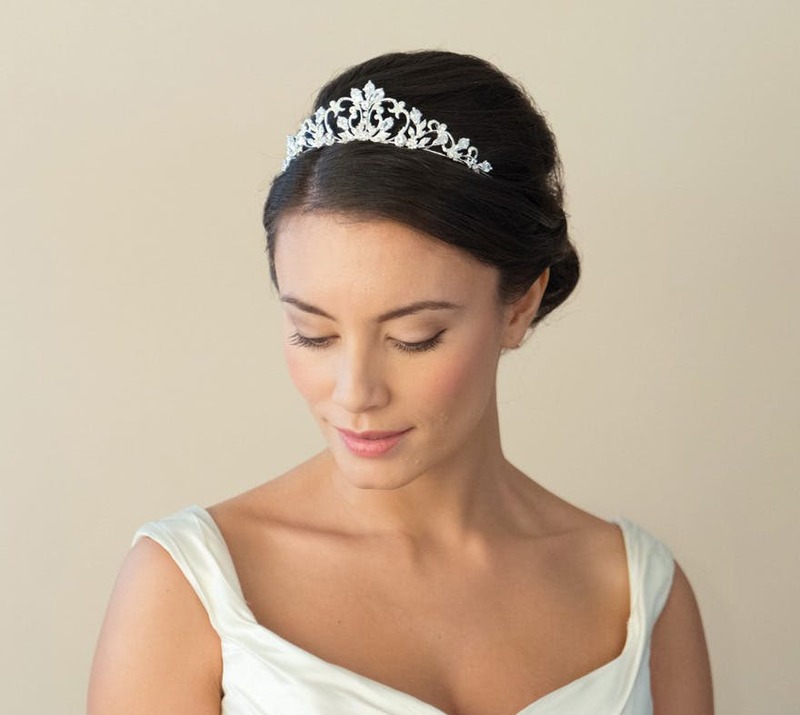 Wedding tiaras are a classic wedding hair accessory and one of the most popular. They come in so many shapes, sizes and styles too, so you’re sure to find something you’ll love. 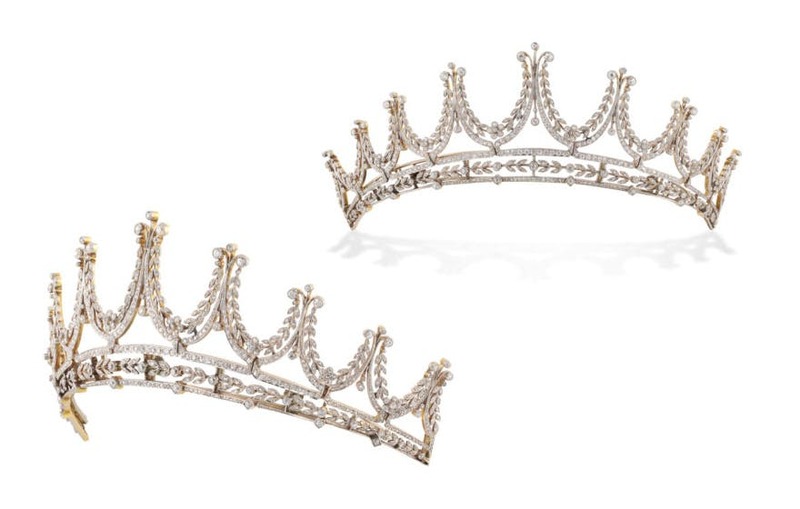 Here are 23 of our favourite wedding tiaras, each one fit for a princess. 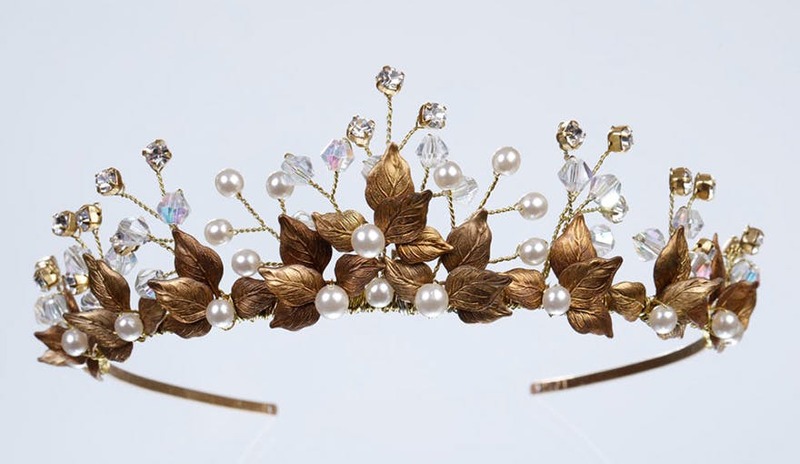 This Victoria tiara from Stephanie Browne is a stunning piece of art inspired by the Victorian era. It’s hand made in Australia with semi-precious quartz and plated with rhodium (part of the platinum family of metals), and the final piece is stunning. 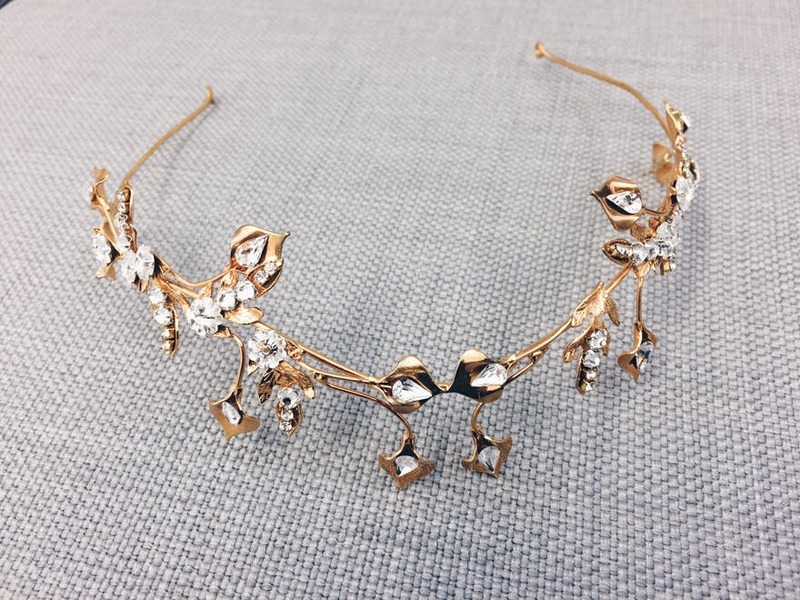 This tiara is more than worthy of your very own fairytale wedding. 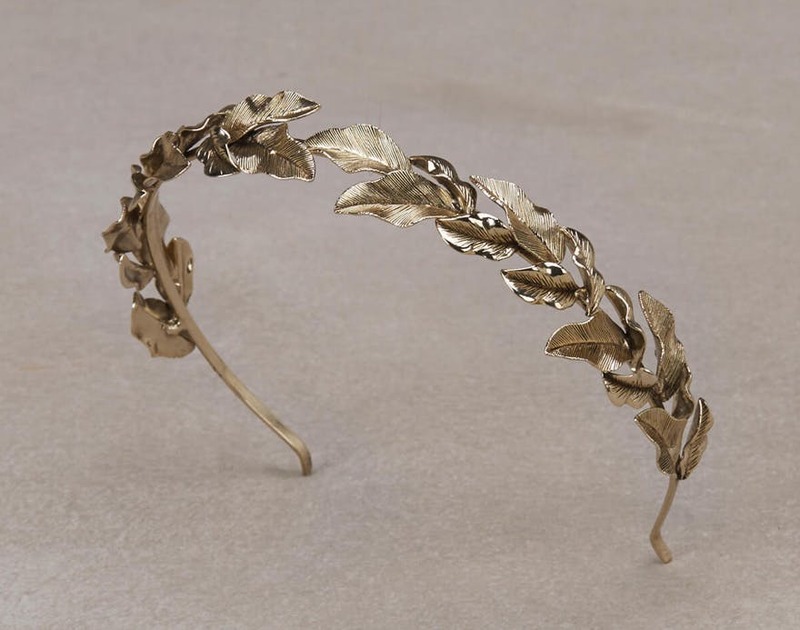 Lis Diadema by Pronovias is almost reminiscent of a Greek-style wreath, being inspired by natural motifs like crisp leaves and made in the style of old gold. Pair it with a Greek goddess style wedding dress to complete the look. 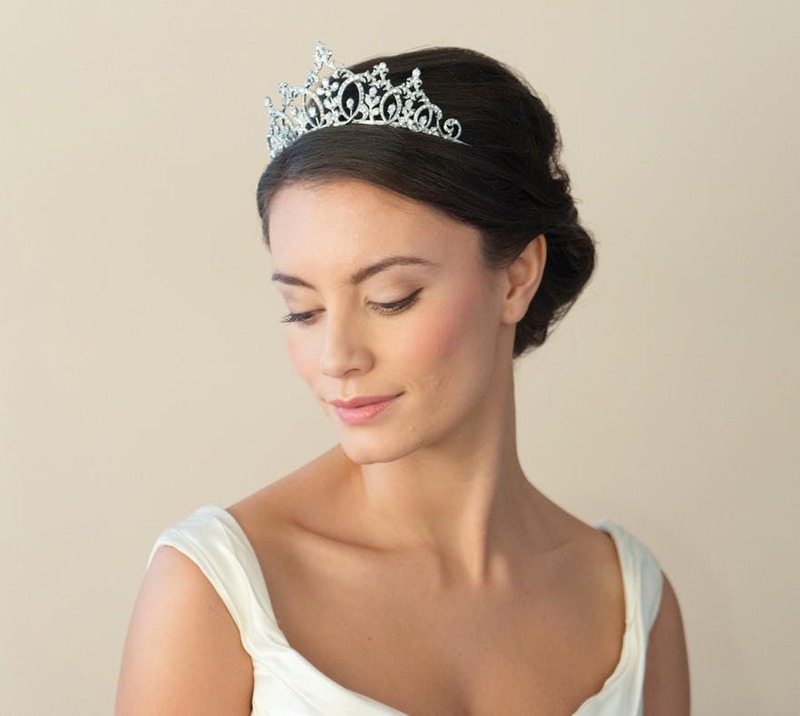 The elegant Hepburn tiara from Ivory & Co is named, appropriately, for Hollywood icon Audrey Hepburn. It’s made from “genuine Austrian Crystals and Russian man-made diamonds” that include “cut solitaire stones…set in two matching heart shapes” and intertwined leaves. It’s also plated in real silver. 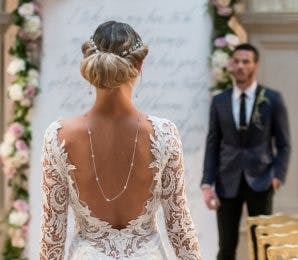 The overall design is inspired by the 1950s jewellery worn by Audrey Hepburn in many of her movies, so it would fit perfectly with a retro or vintage wedding theme. 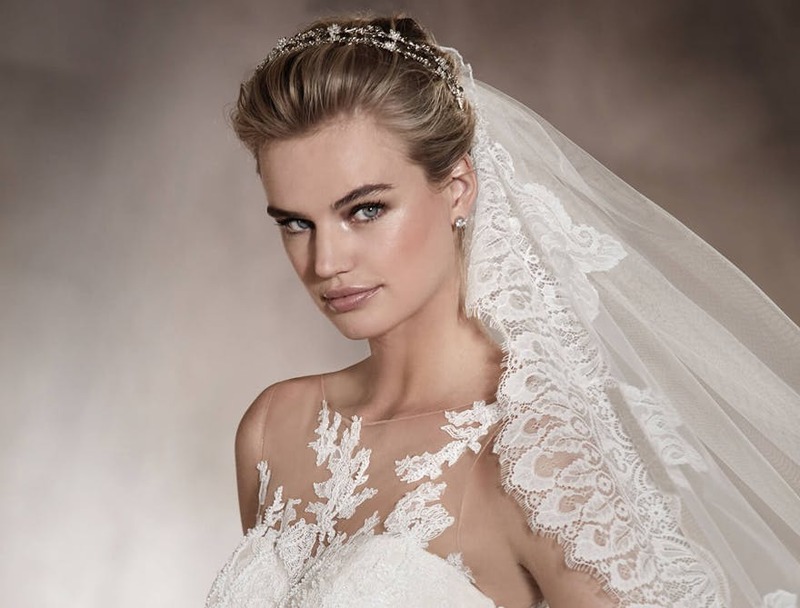 The Ravel Diadema by Pronovias is a very fine and delicate tiara that isn’t as loud as your average princess-inspired hair accessory. Made of aged silver and gemstones, this pretty tiara is inspired by floral motifs and is an understated but stunning finishing touch to any bridal look. 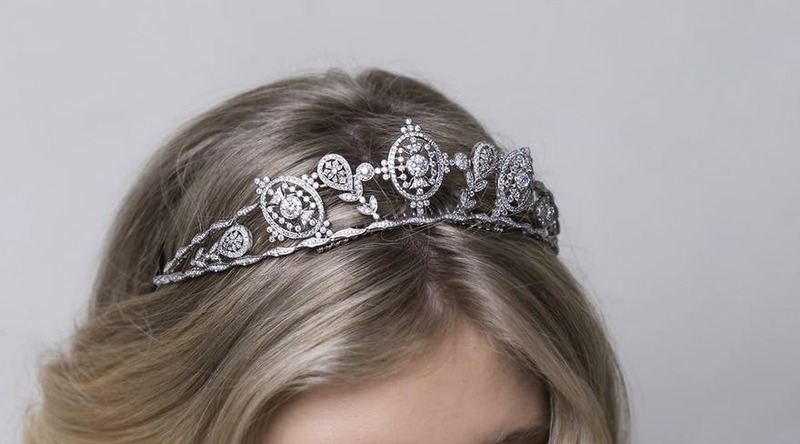 This elegant Demetria tiara from Ivory & Co is plated in real silver and is made from Austrian crystals that have been cut to sparkle like diamonds. The stones are set into floral and leaf patterns, and the metal is flexible for maximum comfort. You can wear it higher on the head as a tiara or lower across the brow for a more bohemian slant, which is great for a nature-inspired bohemian wedding. This beautiful silver tiara (style TLT4676) from Twilight Designs is heavily influenced by beautiful florals and features strips of sparkling diamantes that would look incredible for a glamorous wedding theme. We love the contrast of the gold and sparkling gems on this grand tiara from Halo & Co! 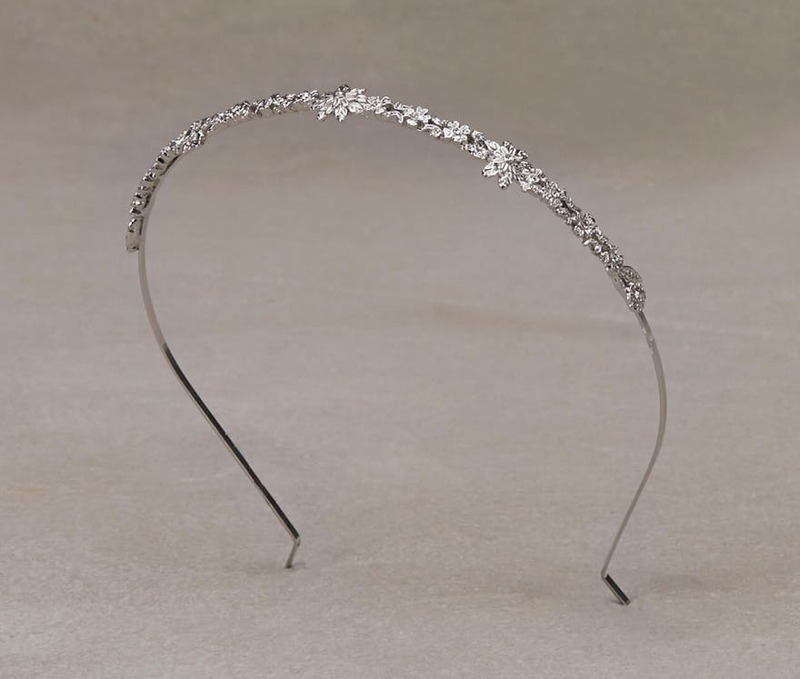 Grosella is an elegant headband-style tiara by Pronovias, crafted from aged silver and gemstone appliqués and giving an interesting double effect. 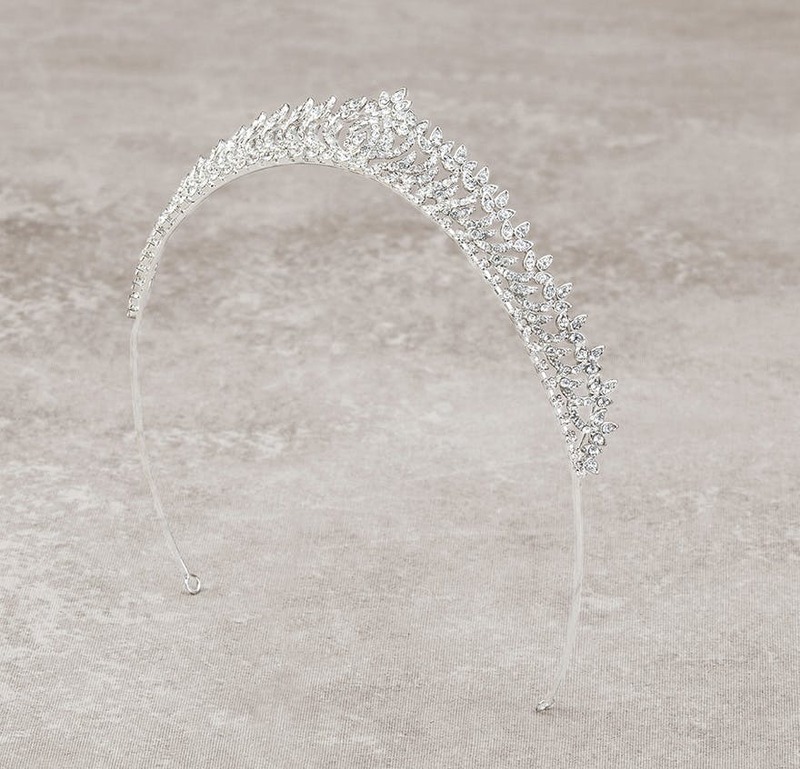 The Saunton tiara by Claire Austin England is a handcrafted statement headpiece made from brilliant crystals that have been set into a collection of circular, geometric designs. Each one is hand-sewn, and finished with a cream ribbon. Wear with an elegant bun wedding up do to get the full tiara effect. 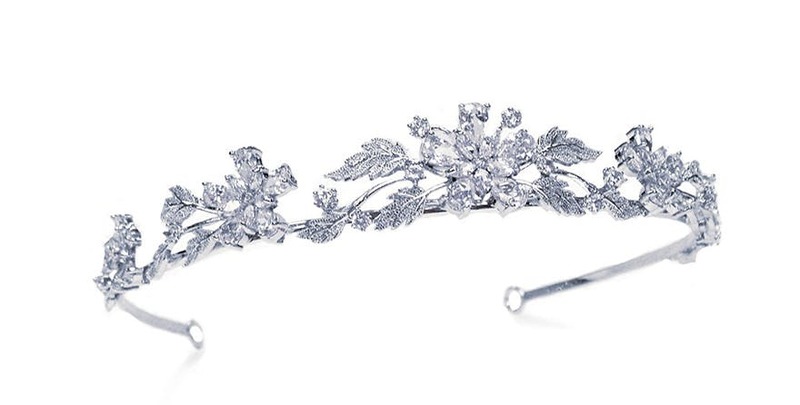 Ivory & Co’s breathtaking rhodium-plated Honeysuckle tiara takes its influence from Neo-classical design and is crafted from “genuine Austrian crystals and Russian man-made diamonds”. 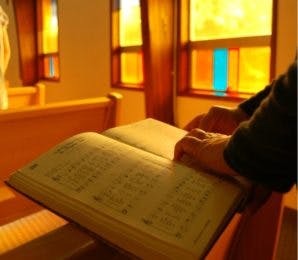 Its design is that of a beautiful garland full of vines, flower petals, teardrops, and embossed leaves. 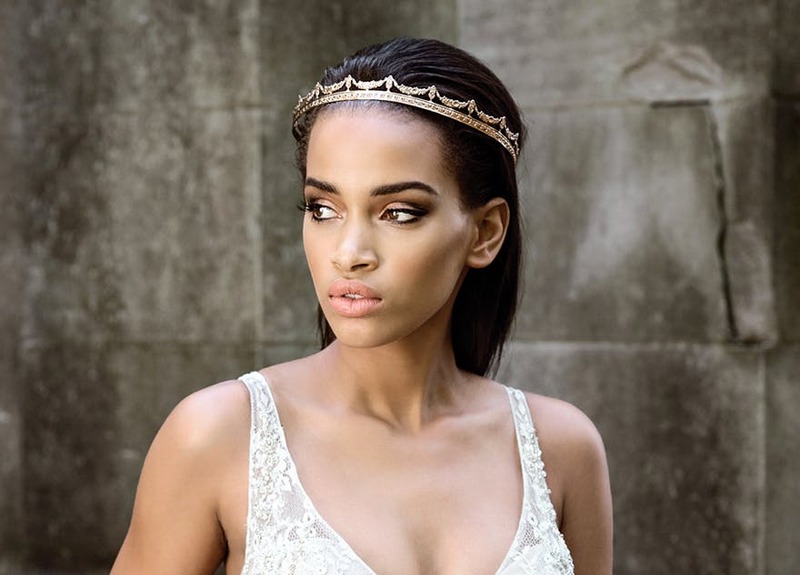 You’ll feel like a true queen with an ornate golden tiara or crown-inspired headpiece like this “baroque halo crown” from Mordekai Luxury Hair Accessories. Palau Corona by Pronovias is one of the most magnificent wedding tiaras with its thick headband-style design and aged silver and gemstones. 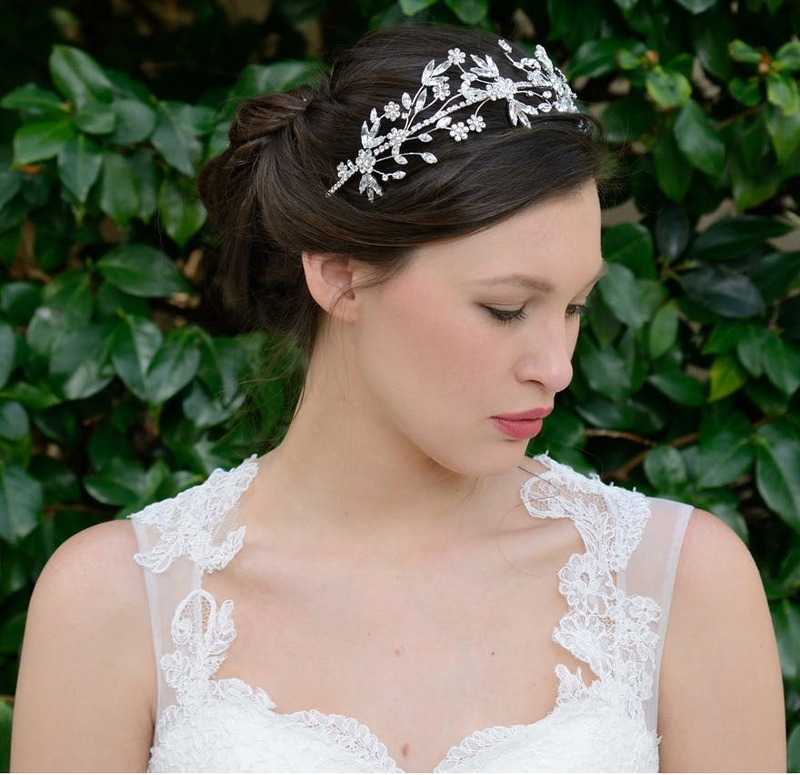 This diamante band by Linzi Jay features a collection of large daisy-inspired flowers and can be worn flat like a headband of higher on the head like a beautiful tiara. We think this would fit perfectly with a spring themed wedding. 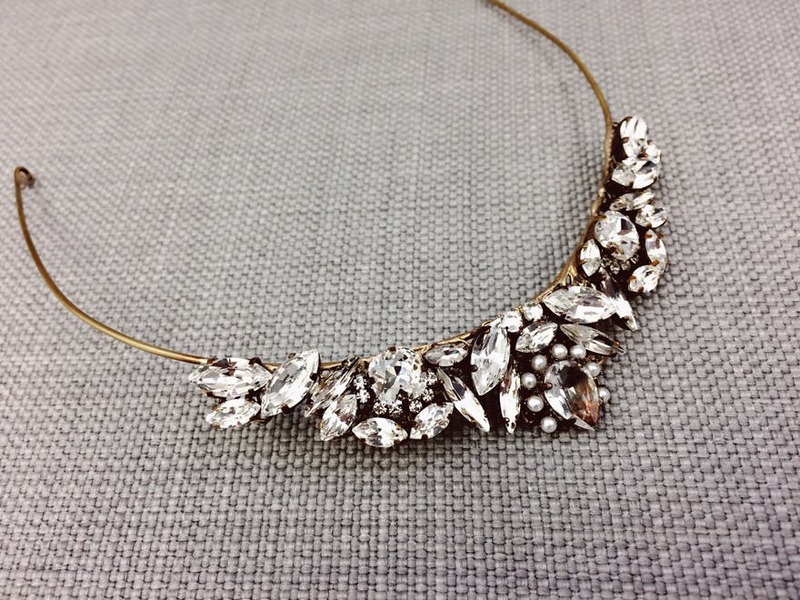 This is another tiara from Halo & Co that dazzles with sparkling crystals and old gold. It’s sure to make a statement, and would look especially stunning for a woodland inspired wedding. 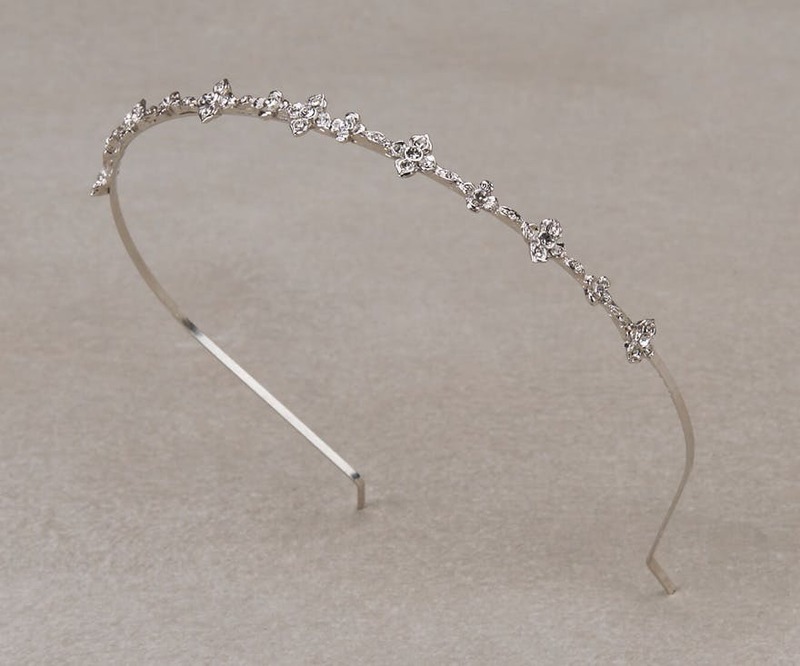 The Tibidabo Diadema by Pronovias is another narrow headband-style bridal tiara crafted from aged silver and gemstones. It’s a very subtle accessory, but also very refined and very effective.It’s also all but guaranteed to complement your wedding dress. This Cosmos band from AM Faulkner is a very sweet floral-inspired hairpiece, embellished by hand with over-sized sequins and beads to create a beautiful contemporary look. Ivory & Co’s Imperial Beauty tiara is influenced by Renaissance designs and is one of the most fairytale-esque wedding tiaras on our list. Just look at the intricate leaf designs, the sweeping lines and the sparkling gems (which are once again “genuine Austrian Crystals and Russian man-made diamonds”). 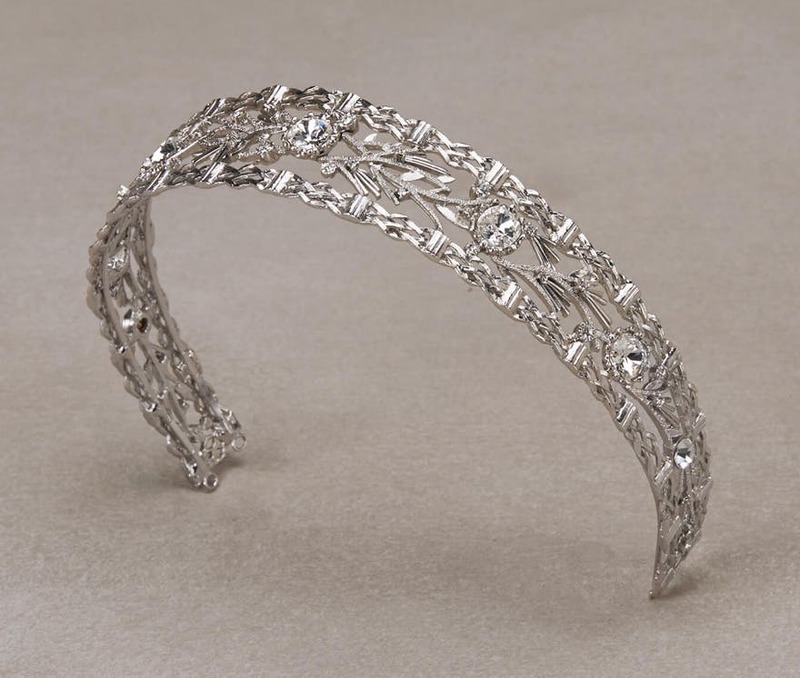 This beautiful princess-style tiara is also plated in rhodium “for a darker antique finish”. This unique Silver Fern tiara by Stephanie Browne is part of the Luxe & Luminous Collection and would make a fantastic statement piece. It’s “New Zealand inspired” and made using stunning Swarovski crystals. We also think this would look fantastic for a luxury destination wedding on a beach. 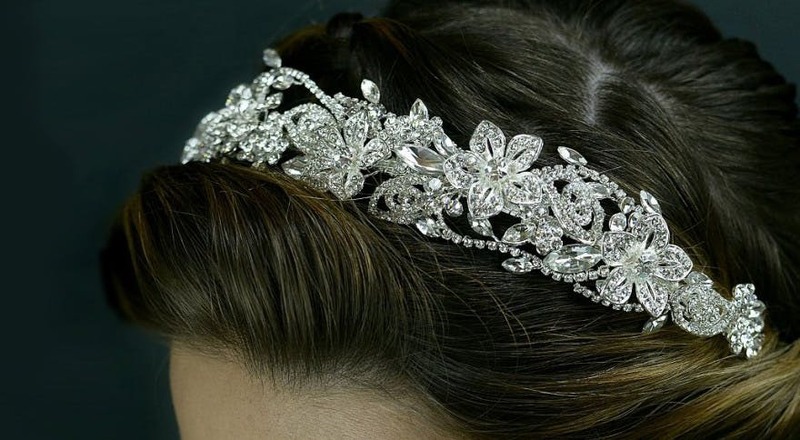 A large diamante flower is the centrepiece of this beautiful tiara by Linzi Jay. It’s a classic and traditional design, and that makes it one of the most beautiful wedding tiaras on our list. 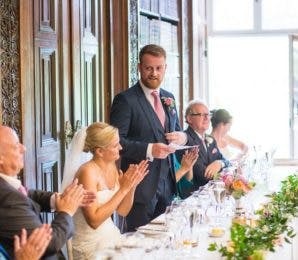 It would look right at home at a wedding set in a beautiful stately home wedding venue! The Bromiley tiara from Miranda Templeton’s Davenport Collection is a magical design reminiscent of fairy princesses in fantasy novels. 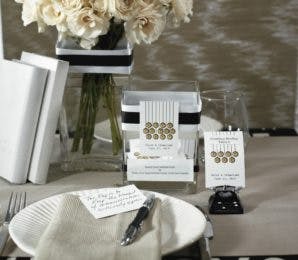 It features “heritage gold leaf clusters” surrounded by ivory pearls and crystal diamantes, and it’s simply enchanting. This beautiful tiara (style T2-2651) by Pronovias is made from aged silver, gemstones and mother-of-pearl and has an almost icy effect that would be perfect for a winter wedding. This Pixie tiara from Ivory & Co is crafted from “Russian man-made diamonds” and plated in rhodium. The pretty star-like flowers are simple but very beautiful, making an overall very elegant, very versatile wedding tiara that fits perfectly with all manner of dresses and hairstyles. 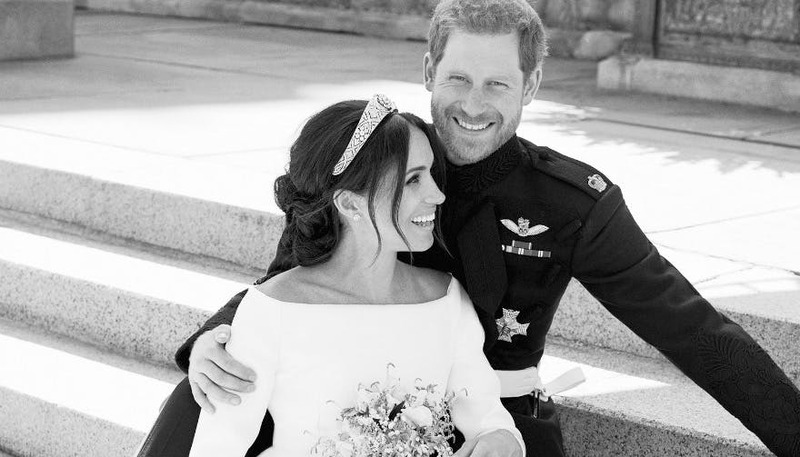 Finally, if you have the means you could go all out on a luxury wedding tiara that’s fit for royalty. For example, this Edwardian diamond tiara by Bentley & Skinner is an absolute masterpiece. Edwardian and Art Deco style jewellery is beautiful, and this one features “foliate swags and floral motifs graduating from the centre, set with old brilliant-cut and rose-cut diamonds estimated to weigh a total of 8 carats, all to a yellow gold mount with detachable frame”. It’s also available for hire! How could you possibly choose a favourite when they’re all so beautiful?? Furthermore, before your wedding day you could also show off your love of wedding tiaras with these fun “Bride” and “Bridesmaid” tiaras. They make the best hen party accessories and/or photo booth props! Now that you have your princess-worthy tiara you’ll also need a venue to match—check out these stunning castle wedding venues! 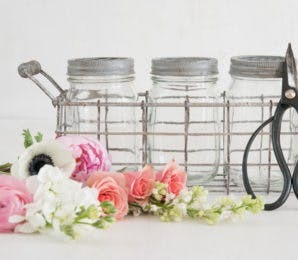 And for even more beautiful bridal accessories, don’t miss these amazing alternative accessories for your wedding, hen party, or honeymoon.